The Idle No More movement began quietly back in early October, when four aboriginal women held a teach-in in Saskatoon about the destructive effects of the Harper government’s omnibus budget Bill C-45. 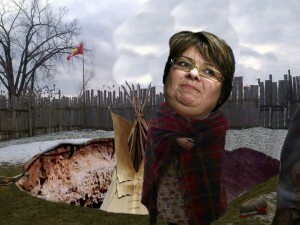 It was not until mid-December, however, that the movement gained widespread attention with the high-profile hunger strike of Chief Theresa Spence of Attawapiskat First Nation, who set up a tipi just beneath Parliament Hill in Ottawa and demanded a meeting with the prime minister and the governor general as the main condition for ending her strike. Since then, rallies and solidarity actions have been held around the world. In a manner analogous to the rise of the Occupy movement in the fall of 2011, when the arrest of 700 people on the Brooklyn Bridge and the pepper spraying of peaceful protesters helped to galvanize widespread attention and increase public support, Chief Spence’s hunger strike has been a focal point for the national media in Canada. On the one hand, this has helped to open space for national (and, increasingly, international) attention on the plight of First Nations people, forcing even the most reactionary defenders of the status quo to admit that there is a serious problem. On the other hand, however, the media’s penchant for fixating on symbolic figureheads like Chief Spence has presented a significant barrier to connecting the dots between this movement and the ongoing legacy of colonialism and racism, along with the broader issue of neoliberal capitalism. It is of course historically significant that Chief Spence was able to force a meeting with the prime minister on January 11 — which she turned down due to the absence of the governor general, vowing to continue her strike. But the disproportionate focus on this confrontation between Canada’s First Nations chiefs and the federal government has had the effect of placing undue emphasis on the traditional channels of power, when in fact the true source of the movement’s vitality is in the thousands of ordinary citizens who are being mobilized and energized, both online and in the streets. Moreover, the focus on the chiefs and the politicians has enabled critics to raise distracting accusations that the chiefs’ alleged greed and incompetence is the main source of ongoing problems for aboriginal people. Discussion of tax-exemption and “special treatment” has been common, which in turn leads to proposals for selling off First Nations land and calls for assimilation. While there are no doubt problems to be dealt with regarding the role of First Nations leaders and their governance practices, the near-singular focus on these matters has been a convenient scapegoat, and it has often aligned with stereotyping and even racist characterizations — from accounts of Chief Spence’s hunger strike as a “diet” to the age-old trope of the “angry Indian.” These and other such depictions serve not only to distract from the larger issues, but also highlight how much remains to be done in changing the dominant narratives. Equating Idle No More with Chief Spence and her hunger strike means missing a great deal about what makes the movement so important. It means overlooking the concrete plight of so many First Nations people, as well as that of other indigenous peoples around the world who have been inspired by the movement. Getting overly caught up in the twists and turns of her interactions with the government runs the risk of failing to identify the Harper regime as, fundamentally, the bearer of a radical neoliberal agenda. Changing the narrative does not, of course, mean dismissing Chief Spence’s hunger strike altogether, but rather seeing it as a conduit for the voices of those who have been long suppressed. Chief Spence has helped to galvanize tens of thousands of First Nations people and their supporters to take to the streets like never before, performing round dances and drum circles, marching on government offices and businesses, hosting teach-ins, building communities’ ties and engaging in slowdowns and road blockades. With the aid of social media, new “networks of outrage and hope” have been created — to borrow the title from Manuel Castells’ new book on social movements in the Internet age — which allow for more advanced coordination, for the sharing of videos and stories, and for undercutting the dominant assumptions about what is politically possible. Everytime someone says #Ottawapiskat, Ezra Levant mutters something racist and pees in his pants a little. Such viral messages, in combination with ongoing rallies, teach-ins, and deepening ties between already existing organizations and the grassroots will be crucial in the fight ahead. Chief Spence’s hunger strike came to an end this past Thursday, January 24, along with the strike of Manitoba elder Raymond Robinson. The decision seems to have been provoked by a combination of pressure from Spence’s own band council, from opposition parties in the Canadian government and from the apparently waning public opinion regarding her strike. The 13-point declaration released as she ended the strike once again demands a sit-down meeting with the prime minister and the governor general — a meeting, it would appear, that Chief Spence will not get. It is not clear at this point what to expect next. The Harper government has played its hand carefully, offering little more than an agreement to engage in further talks. As actions ramp up, from the spate of blockades on January 16 to the global day of action that has been called for this Monday, January 28, it is more important than ever to have creative alternatives to combat the mainstream status quo and the counter-narratives that the state and its allies are likely to use in the coming weeks and months. While the focus on Chief Spence often distracted from the truly grassroots nature of this emerging movement, it created a groundswell that has opened up space for voices that don’t often get heard. In a social movement’s lifespan, this early phase of spectacle is a chance to help change the narrative, to organize alternatives and to turn away from past mistakes. But after the spectacle dies down, the real work begins. Matt Sheedy is a PhD candidate in religious studies at the University of Manitoba, Winnipeg, and associate editor of the Bulletin for the Study of Religion. His research interests include critical social theory, secularization and ritual theory, fundamentalism, ethics and social movements. His dissertation offers a critical look at Juergen Habermas' theory of religion in the public sphere and he is also conducting research on myths, rituals and symbols in the Occupy movement, which includes fieldwork at Occupy Winnipeg. His website is MattSheedy.com. Blessings to Chief Spence and Elder Robinson for putting their lives on the line to bring attention to the great wrongs done the people by the Canadian government. Blessings on all who have fasted and put their bodies on the line to save the land, air, water and the very Earth itself. Bless Idle No More for bringing focus to the needs and rights of the people. We must do all we can to manage government to protect the rights and interests of all life. Any narrative using “Indigenous peoples” as the unquestioned “owners” of land places the Human as having come into existence on certain places on the Earth. Clearly humans didn’t spontaneously appear everywhere they can be found today. These arguments over who and where were there to make claims to ownership is a concept needing to be addressed also, if not more so, than any other concept discussing Nations, politics, and religion. Locking a group to a certain location in perpetuity denies reality, and marks those people’s offspring to certain inhuman consequences, for the basis of life is to grow and to spread. This is what has always bothered me concerning conservation efforts with wildlife. What is where one looks is only a snapshot and not the much more telling before where things came from and what has been there over time. Conservation wants to lock things as they are, and not let nature take its course in adapting to the always changing planet – Earth. While First Nations and any other “Indigenous peoples” have legitimate claims, as they struggle on, the question of the purpose of human life goes unresolved and unnoticed. For without addressing Our purpose, because We Are different than all of the other creatures, we continue along acting as through We aren’t different. The profoundness which makes humans / people different than all other creatures is our ability to leave this planet at will. This difference must be respected more than it is. As much of the spirtuality and rhetoric emerging from the Idle No More movement suggests, I think First Nations peoples would be the first to agree with you about the meaninglessness of ownership over land or territory, and the need to rethink the relationship between people and land. The very idea of their being “indigenous” comes as a reaction to the experience of being colonized by a society that does believe that human beings can own land, and that they should exploit its resources as much as possible for their own benefit. First Nations people have had to claim their rights to and possession over the land in this way mainly because another people came along and tried to remove them, or pretend that they weren’t there. “Indigenous” is not a universal, it’s an invention of realist politics. And before dismissing it, we need to be conscious of what circumstances necessitated it. It’s not clear what is being said here. You write that “conservation wants to lock things as they are…”. Where did you get this impression? I work on conservation issues to protect nature preserves & wildlife sanctuaries. None of us, among the activists involved, regards “conservation…locks things as they are…”. Conservation groups that I am familiar with always work with the shifts & changes of nature so your statement seems to reflect some personal misunderstanding. Re: your other assertion “locking a group to a certain location in perpetuity denies reality.”. Up to 20 million people came to inhabit America over the course of 15,000 to 20,000 years. 90% died from disease during the initial years of European colonization (primarily the British in North America) As a result of this demoralization their land was easily appropriated by a conquering power. Ireland suffered similarly when the British invaed & expropriated 9/10 of their land in the 17th century. But in regard to North America, there is a moral imperative that those who colonized give some redress for the usurpation & expropriation of native land, if for no other reason than to alleviate their own guilt. Thanks for your comments on this Eric. I appreciate your challenge on the use of labels/language and the problems that this can bring. I find myself in agreement with Nathan’s comments when it comes to the historical nature of such labels. As a white male raised in North America, for example, I can honestly say that I have never tasted the sting of racism or discrimination. My ancestors, however, who were mostly Irish Catholic, certainly did taste discrimination and, from what I understand, strongly affirmed their identity over and against those who were colonizing them or treating them as second class citizens. I even have militants in my family tree. I, on the other hand, have been able to choose my identity in such a way that my maleness, whiteness, or Irish Catholic heritage has never marked me as “other” and I feel perfectly free to negotiate or drop these labels if I so choose. But I take that to be a rather privileged position that others aren’t so easily able to negotiate (e.g., so called visible minorities) and so the issue of agency is far from neutral. I’ve spent many decades teaching myself not to use labels when referring to others. However, I do note these labels are still used. My perspective is that the labels are what keeps people in conflict and at war – leaving progress to wait. Is this overwhelming return to identity in all of us? My own would place me outside of the mythical American one of today, yet I don’t feel a loss, generally. Is there a struggle to see who’s identity is carried into the next generation? After all, since the 60s, I’ve been told these things are only skin deep. But, this is apparently not the case. Is this type of story something I don’t understand? Not at all, except for what perhaps isn’t being said – collective guilt for events from another century? The hand of history shakes all who hold it, but it must not restrain progress. I find that holding that hand too much is a distraction, but without acknowledging the cruelties of some people towards other people, no one will know and understand. However, who did what is the answer not questioned much. Movement and progress are no myths. Humans have been doing so for as long as they’ve been around. And, yes they have been cruel to one another, but also not. If we were to examine all of the cruelty in the past, we would grow old and die before we could ever possibly finish. Much of which is in the un-knowable pre-historical. Each, and every, group of people must hold cruelties in their past, it stands to reason. So, is there collective guilt? Not if done before your birth, I think. If there is, then other questions and problems arise, as in who determines these guilt’s and when each guilt ends. Punishment for something not done is what happens when this guilt idea is entertained, causing more cruelty and the persistence thereof. My goal is to keep moving, because it’s the way of life. Nothing in existence is without movement – nothing. Even the mightiest of Redwoods sway in a gentle breeze. Idle No More was started by 4 women in Saskatchewan in response to Chief Spence’s actions. Her hunger strike was a courageous attempt to change the relationship with government from subservient applicants back to the original nation-to-nation relationship. The Assembly of First Nations (similar to the NDP) is a reform group working within the boundaries created by government. Their takeover of the debate (with the help of the media) allowed both they and the government to declare success, and keep the issues inside the box. Chief Spence is an admirable example of the kind of people we need in order to reshape our society. Idle No More has now lost most of its focus; much like Occupy did. Gerry, thanks for your thoughtful comments. Although Chief Spence’s action came after the initiative of the 4 women in Saskatoon, starting on December 10, 2012. The AFN–for Americans who may not know, the NDP is the social democracy party that has been pulled to the right, like all other mainstream parties, in recent years–work largely within those government boundaries, though they still have some ties to the grassroots and will (sometimes) respond to pressure. I’m not sure if INM has lost its focus, however, since that presumes that there was a focus to begin with. For me, Chief Spence’s strike was a phase of spectacle, with a lot of noise, smoke and mirrors. But it also galvanized a lot of people and got people together that weren’t connected before. Common Causes is a new initiative that has come out of this and aims to bring different grassroots groups together to build a coalition in solidarity across many related themes (e.g., social justice, the environment, racism, etc.). This seems promising to me and is what, in my opinion, we should be looking toward now as the spectacle has died down. I won’t debate the role of Chief Spence here, but I will point out that Common Cause in both the US and Canada are simply another reform movement appealing to governments to “make it better” (similar to the NDP’s role). Which is fine if that’s all you want — and if you’re dealing with a government that gives a damn. Curious, The Americans got rid of their Euroasian forced borders over two centuries ago under their indigenous Spymaster-General George Washington. Americans did not migrate from Euroasia as the debilitating prose of British colonial pseudoscience dictates, but rather Americans are progressive free-market capitalists of their own evolution within their own American Hemisphere, and they are ultimately a military espionage empire. If this is all being done for anything, it’s being done to rejoin Canada into The American Hemisphere.